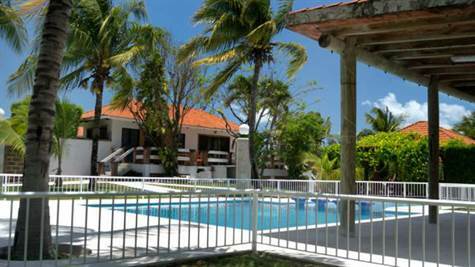 Beautiful Mexican style house just 10 minutes from Cancun, in residential Villas Petempich. It has an area of almost 53,918 square feet. Its interior construction of 3,229.17 square feet on one level, offers a magnificent distribution, where lighting is manifested in every corner of this beautiful property. It has 3 bedrooms, 4 bathrooms, dining room and excellent size that allow its people to comfortably enjoy daily living. The kitchen is equipped, the house features air conditioning in minisplit units, ceiling fans and its magnificent orientation which allows an excellent ventilation. It also features a private pool, BBQ area, storage space basement style, ample green areas, half basketball court of 1,743 square feet. The roundabout at the entrance of the house is beautiful and the complex features a small house that can be used by the neighbors for events. There is also a magnificent pool / waterfall built on a dry cenote. It has control access to the main entrance. Do not miss the opportunity to live and enjoy this magnificent house near the sea.